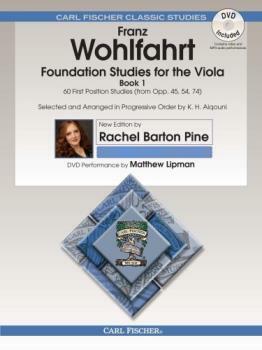 Our new edition of the famed Wohlfahrt Etudes is a masterclass in book form by violin all-star Rachel Barton Pine. She discusses dyanmics, augments Wohlfahrt's own bowing suggestions with her own, and provides solid advice for approach to the Etudes. With all of this, the book includes a DVD with performances of all Etudes by Matthew Lipman and MP3 tracks for study. Not just a new edition, Pine's approach to Wohlfahrt is holistic guidance to ensure the best possible use of this standard pedagogical foundation.